Hi everyone! Well, today I stepped out of my comfort zone and let my kiddos make homemade moon dough. Who knew a little flour and some baby oil could keep my kids busy for so long? Now I must admit, I have a love/hate relationship with moon dough. 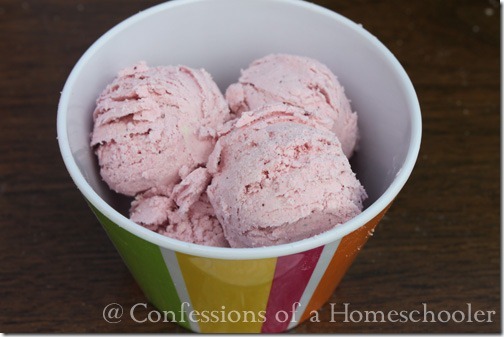 My kids love it, and I hate the mess it makes! That said, we braved the mess and made some of our own for super cheap. We also did it outside. In a large container, mix flour and baby oil until well blended. Mixture will be smooth and pack easily together in your hand. To color the dough, add in a finely crushed piece of pastel chalk. I found the red one worked best to color the dough. We also tried a green and blue one, however the color wasn’t quite as dark when mixed in the flour. The Teeny Tot absolutely loved this stuff, I think she played with it for another hour or so after the big kids lost interest. P.S. 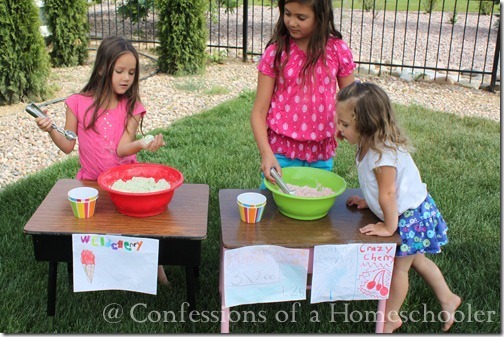 I found this fun idea over at Inner Child Fun, it’s a wonderful blog with lots of great ideas! If you haven’t stopped by yet, make sure to! You won’t be sorry! 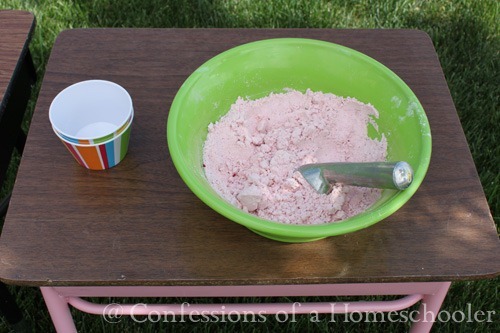 Hope the homemade moon dough helps keep your kiddos busy and shew away some of those summer boredom blues! 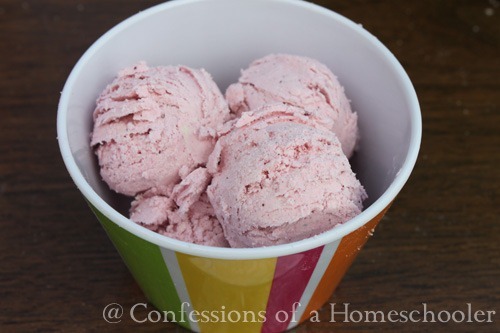 I thought the picture looked like ice cream for sure. YUM! 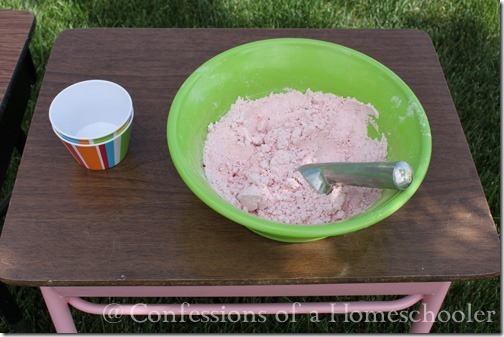 I have made some homemade play dough before, but the recipe was totally different. My kiddos love it also. I am a new reader, and I am completely overwhelmed already! How in the world do you find time to create/think this up, make, clean, photograph, write, and take care of your home and kids all in one? It’s your gift and calling!! It’s such a blessing to have your blog as a reference. I am just jumping on the homeschooling wagon and it’s neat to see that other’s have gone before and are willing to share their wisdom with us newbies. Thanks, and seriously…how do you do it? I am looking forward to using your us geography next year!! how would you make it more like a dough and not sand? 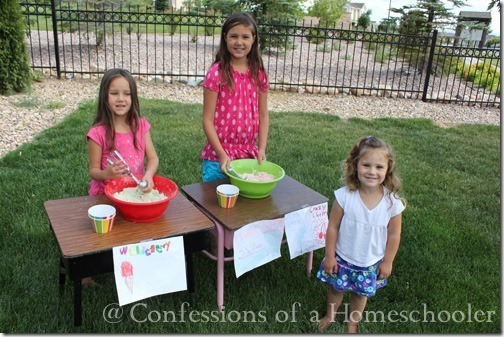 i still want to make the smooth airy moon dough,sticky mushy playdough. I’m not sure you can make that mixture into a dough, it’s a really smooth silky mixture. You can make it a bit more into a dough by adding a little bit more baby oil to it. It’s not going to be like a playdough type of dough, but it will be a bit more pliable to molding.